Atomic Force Microscopy (AFM) is a surface characterization tool that can provide topographic images and quantitative information in both lateral and vertical dimensions. 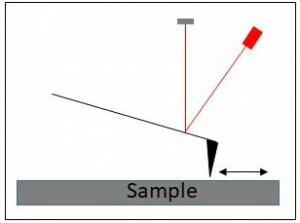 An topographical image is generated when a cantilever with a sharp tip is scanned across the sample surface and the deflection or amplitude of the cantilever is monitored using a laser beam on the back of the cantilever. In addition to topgraphical information, AFM can provide mechanical properties information, including elastic modulus and adhesion.